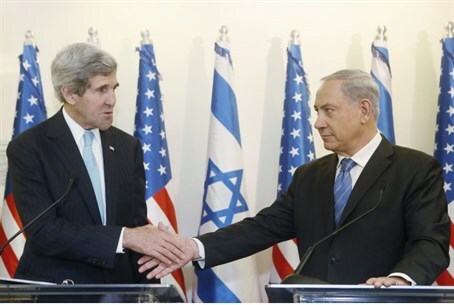 Israel, PA leaders reportedly receive controversial Kerry proposal for creation of PA state. Israeli and Palestinian Authority leaders have received copies of United States Secretary of State John Kerry’s proposed diplomatic agreement, the PA’s Al-Quds newspaper reports. Copies of the proposal have reportedly been given to Prime Minister Binyamin Netanyahu and to chief PA negotiator Saeb Erekat. The report has not yet been confirmed by officials on either side. The Kerry proposal has been the subject of speculation over the past several weeks. Journalist Thomas Friedman reported in January that Kerry’s deal includes a PA capital city in eastern Jerusalem and would create a PA state in Judea, Samaria and Gaza with borders based on the 1949 armistice line. The deal would require the PA to recognize Israel as the state of the Jewish people, and to give up the demand for the “right of return” to Israel of descendants of Arabs who fled the country during the War of Independence in 1948. Friedman’s report contradicted an earlier report from Xinhua which said Kerry had proposed the “return” of 80,000 Arabs to Israel. There has been concern in Israel that Kerry plans to “attack” Netanyahu with heavy pressure, and coerce him into accepting terms that will be bad for Israel’s security, including a withdrawal from the Jordan Valley. Likud MKs have warned that if Netanyahu were to give in to Kerry, it would mean the end of his party – and new national elections. U.S. President Barack Obama has reportedly promised Netanyahu that his administration will expect concessions from the PA, as well.